Small-Screen 66 – #49: Ripley’s Believe It or Not! I was wondering if after all these years you’d like to read the rest of this Countdown. Part of the reason I’ve been holding off so long (in addition to mere laziness) is the fact that most of my “Small-Screen 66” entries so far have averaged around 1,500 to 2,000 words in length, and I found it difficult to write that much about today’s selection. But here goes. Ripley’s Believe It or Not! is a multimedia franchise dedicated to showcasing unusual and interesting facts for their entertainment value. These “oddities” include anatomical anomalies, freak coincidences, strange works of art, and offbeat cultural practices past and present. 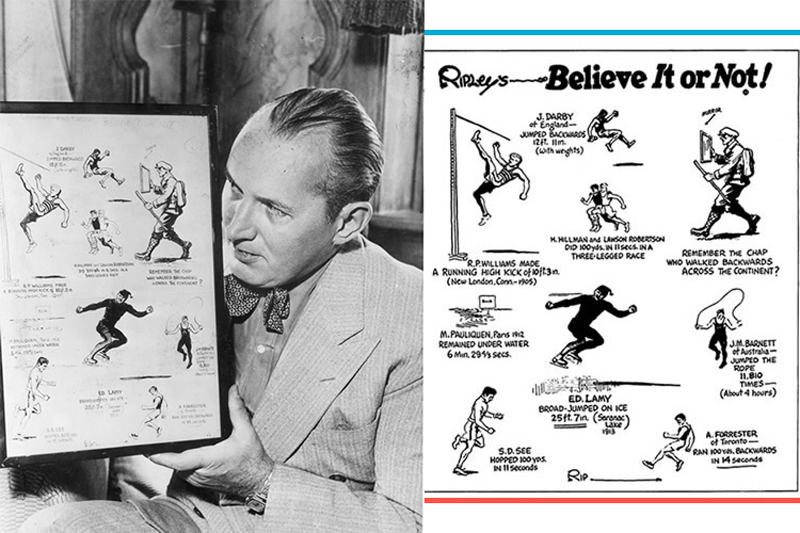 Cartoonist Robert Ripley began the series in 1918 as a comic strip devoted to sports trivia, originally titled “Champs & Chumps.” When he eventually broadened the focus to include topics other than sports, the name of the series changed accordingly. Each “strip” consisted of a single splash panel depicting the freakish feats described. Robert Ripley holding the original “Champs and Chumps” strip that started it all. But Ripley was also known for shining the spotlight on small-town oddities throughout the American homeland. He often published facts and photos submitted by readers from across the country. Jumping at the chance to see their name in the paper, the nation’s public responded with an onslaught of letters, and at the height of his popularity, Ripley is said to have received more mail daily than the President of the United States. A successful Believe It or Not radio series gave rise to a string of newsreel-style short films, and eventually to a television incarnation of the franchise. Ripley liked to host his radio and television programs under unusual circumstances, and as such could claim many broadcasting firsts, including the first radio broadcasts from underwater and from a hot air balloon, Even more impressively, he is alleged to have been the first person ever to deliver a simultaneous radio broadcast to every country on Earth. In 1949, Ripley collapsed on the set of his TV show – while filming episode #13, and specifically a segment on the history of the military tune “Taps,” as Ripley books and museums never fail to point out – and died soon afterward. But the allure of the sensational and the bizarre endured, and the “Believe It or Not!” franchise outlived its creator. Comic strip collections continued to be published, and “Odditorium” museums displaying curious items from Robert Ripley’s extensive collection began to crop up, with the first permanent venue established at St. Augustine, Florida in 1950. The TV show itself (which, after all, is what we’re here to talk about) ended soon after Ripley’s death. It was resurrected, however, in 1982. This second incarnation, hosted by actor Jack Palance, would become the most popular and longest-running television adaptation of the franchise, and from what I’ve seen, it seems as though it’s right up my alley. Unfortunately, I only stumbled across it while researching this post, When the show wrapped in 1986, I was still four years away from being born. My introduction to the weird world of Ripley would come later. Have no fear, though: If my impression of the 80s version is accurate, an upcoming Countdown selection will cover much of the same ground…sinister narration, early 80s new age soundtrack, and all. But back to THIS post. I was first exposed to the Ripley realm at around ten years old, when I took a road trip to Chicago with my family and brought along a set of “Yes & Know” Trivia books. These books came with a special pen you could write in the book with to reveal the answers, printed in disappearing ink. On the covers, the books promised “hours and hours of ‘by yourself’ enjoyment”…which is one of the most depressing things I’ve ever read. But they fed my hunger for useless information, and when I came across a “Believe It or Not”-branded installment at one of our pit-stops, I snapped it up. My interest grew into an obsession a few years later, when Ripley’s began publishing an annual compendium similar to the Guinness Book of World Records. * Around the same time (my research says 2005), they put out both the first of these annual volumes, simply titled “Ripley’s Believe It or Not!”, as well as the truly colossal “Encyclopedia of the Bizarre.” Together, these two books included about 700 pages of freaky factoids and lush illustrations, and they kept me busy for a while. It was in this period that I also discovered the most recent incarnation of the Ripley’s TV show, which just happened to air on the Sci-Fi channel immediately after I got home in the afternoons. To an insatiable high school trivia nerd, this was heaven. 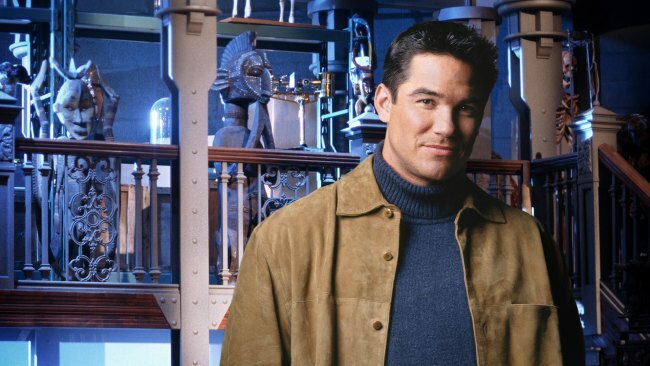 This version of the series originally ran from 2000 to 2003 on TBS (I caught it in reruns), and was hosted by Dean Cain. Cain, best remembered for his turn as Superman in the 90s series “Lois and Clark,” would traipse around a kooky set laden with odd items, providing introductory narration to a string of short vignettes on various people, places, and things in the “Believe It or Not” archives. Hopefully you won’t feel cheated, but now that I’ve led you this far into the article… I must admit that I don’t have all that much to say about the show itself. It presented a variety of cool information in a dramatic way. There’s plenty of spooktacular lighting – actual torches and everything! – and pulse-pounding music to set the mood. But as far as actual content goes, I can’t really remember much. The fact that only a handful of short clips are available online hasn’t helped. I do remember one scene particularly vividly, however, and that will have to suffice to give an impression of the series as a whole. After the main “on location” segments, which would generally only feature Cain in voiceover, each episode would end with a trip to the “Ripley’s Vault.” A bolt of lightning would ignite two huge braziers on the roof of a castle, and then Cain would appear in person to guide us to a secluded corner of the set, where an odd item was fetchingly displayed. In the “Vault” segment I remember best, this object happened to be the taxidermied head of a “geep,” or goat/sheep hybrid. Imagine a slightly scruffy Superman elucidating the fine points of a four-horned, disembodied geep head, and you should get some idea of the show’s appeal. After following the show throughout high school, I was ecstatic to learn upon arriving at William & Mary that Williamsburg was home to one of the many Ripley’s “Odditorium” museums that can be found at tourist destination (or “traps”) worldwide. Though I visited as a freshman, my first personal interaction with the museum staff came at the annual Williamsburg Christmas Parade in my junior year. 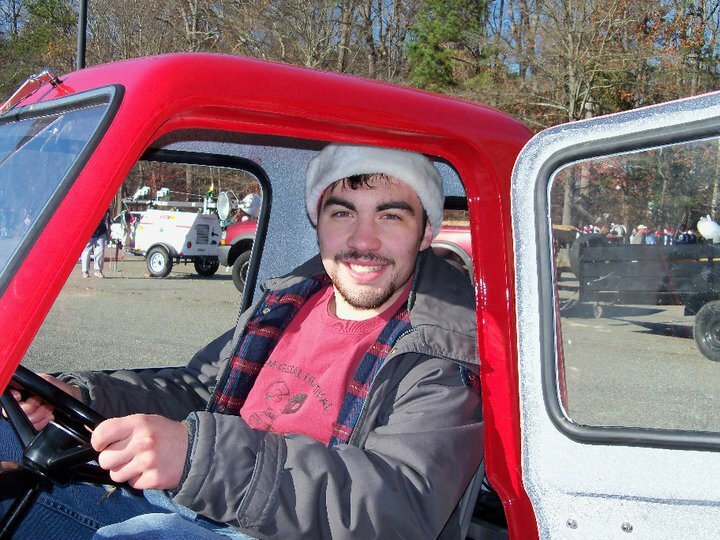 The manager drove a Peel P-50, the world’s smallest mass-produced automobile, in the parade, and afterward we chatted, and I got to sit in the “company car” for the first time. And so it was that when the time came to apply for my first job, nowhere but the Odditorium would do. In the summer after junior year I joined the Ripley’s family as a cashier, 4-D Theater projectionist, and sometime janitor. It may not sound too glamorous, but to date it stands as the most “me” job I’ve ever had, and I loved every minute of it. Though it paid only a few cents above minimum wage, it was pretty dang easy. On days when I ran the theater, as I’ve said before, the job consisted of letting people in, pressing a button on the projector, and letting people out again 20 minutes later. Then I would dry the remaining water and soap-flake “snow” effects off the seats, and repeat the process. To pass the time spent sitting in the projection booth (the vast majority of a shift), there was a locker on hand filled with Stephen King novels. At the end of the day, I would take a craftily concealed secret passage through the back wall, where an industrial washing machine waited to sterilize the stack of 3D glasses. Then I would exit through the museum itself. A word on Odditoriums: Between any two locations, there is bound to be a considerable amount of overlap in terms of what you’ll see. Every museum, for instance, features a statue of Robert Wadlow (at 8’11”, the world’s tallest man), and most include two-headed calves, assorted optical illusion displays, and some sort of tribute to Erik Sprague, the comprehensively tattooed “lizard man.” But each location also has a few things that set it apart. For example, the Williamsburg museum included a “LaseRace” attraction in which guests had to traverse a “Mission Impossible”-style hallway crisscrossed by a grid of laser beams, while trying to break as few as possible with their bodies. But the exhibit that seemed to prompt the most visceral reaction from our guests was the “tunnel room.” Here, guests walked a metal gangway through the center of a large, rotating drum illuminated with star-like pinpricks of light. The turning drum gave the illusion that the hallway itself was rotating sideways, and the effect fooled your eyes and brain so thoroughly that you really did feel as though you were being repeatedly flipped upside-down. For the faint of heart, we even had a “chicken exit” that would let guests bypass the tunnel room entirely. But I’m proud to say that I would end each and every day with a trip through the tunnel, and within a month or so had grown completely immune to it (protip: Stare straight across the corridor at the unmoving doorway at the opposite end, and it becomes like any other hallway). The very last chamber, a “death room” replete with caged waxwork victims, medieval torture machinery, and a forced-perspective graveyard filled with hokey, rhyming epithets, was a bit harder to ignore. In my time at Ripley’s, I got really good at cleaning glass and polishing brass. The day I got the key to the cases and was charged with changing lightbulbs over the hadrosaur eggs, Tibetan skull bowls, and snippets of Wright Brothers’ wing fabric, remains one of the proudest of my life. And at the tail end of my time there, I even won a cashier raffle that scored me an iPad I use to this day. All in all, not a bad career. Critics – including Wikipedia – describe the genre of the “Believe It or Not” franchise as “Pseudoarchaeology.” While I agree that using facts simply for entertainment value, as well as caricaturing the outlandish, “exotic” nature of other cultures may not be the best path toward scientific or historical accuracy, I would argue that Ripley’s media do promote an interest in investigating the world beyond page and screen. And Odditorium janitor or not, I intend to continue exploring our wide world of weirdness. *In a surprisingly crushing revelation, I learned in my research for this post that, rather than being rivals, Guiness and Ripley’s are actually both owned by the same parent company. I really enjoyed this article. Not only did I learn a lot about the franchise and show I’d heard of but knew little about, but I appreciated how personal your reflection was. And of course I’m amped for the continuation of the Small Screen 66.